You can hear them coming from the other side of the valley. The plaintive squealing and wailing calls carry across the landscape and announce the approach of a flock of Yellow-tailed Black-Cockatoos. Suddenly the sky is filled with these majestic exhibitionists. The sound is exhilarating. 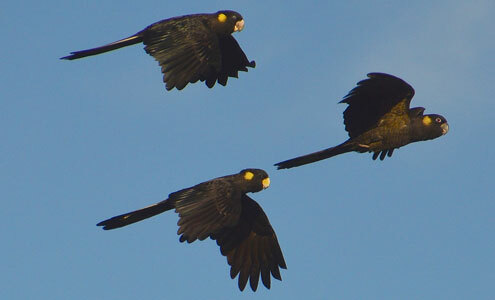 Yellow-tailed Black-Cockatoos are unmistakable in flight, with their slow, deep graceful wingbeats and long tails trailing. They fly with tail folded so the yellow panels are not normally visible - until the bird spreads its tail to turn or land, when the yellow becomes obvious. They have a yellow cheek patch, which is brighter in the female. You can also pick the females by the pale bill, easily visible in flight. The male has a dark bill and a pink eye-ring. And the one making a continual rasping call is a juvenile. For much of the year you'll see them in small family groups, but as winter approaches they join together to form large flocks, at times more than 100 birds in places where there is a good supply of their favoured foods. You can sometimes see large winter flocks on Kings Tableland or in the pine forests of Jenolan and Newnes Plateau. But they are not limited to the mountains - recently a flock of 200 was seen in Centennial Park, Sydney. Their fondness for pine cones is well known. They are one of the few species which appear to have benefited from these introduced trees. But have they really benefited? In contrast to pine forests, native bush provides an amazing variety of seeds from banksias, hakeas, leptospermum, etc, which supply a nutritious diet year-round. And eucalypt trees develop large hollows suitable for nesting, something which the pines don't provide. (Black-cockatoos require a nest hollow more than 30cm in diameter which may take over a hundred years to develop in a eucalyptus.) They are such long-lived birds that any failure to breed might not become apparent until it's too late. Pair bonds are strong and a family (male, female and juvenile) will remain together within a larger flock. When feeding, big woody seed cones such as banksia are bitten off and held in the left foot like an ice cream cone, while the bird systematically tears it to pieces to obtain the seeds. They will also break branches off trees such as wattles, or excavate into the trunk, to extract huge wood-boring grubs inside. People who aren't aware of this habit will sometimes blame vandals or even yowies for the resulting destruction. 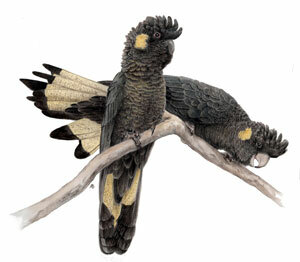 If any bird is evocative of the mountains, the Yellow-tailed Black-Cockatoo is surely one of the strongest contenders. It has long been the Society's logo, and what better logo could there be? Long may they grace our mountain skies! The article above first appeared in the June, 2012 edition of Hut News.